Welcome to Day 1 of 40. 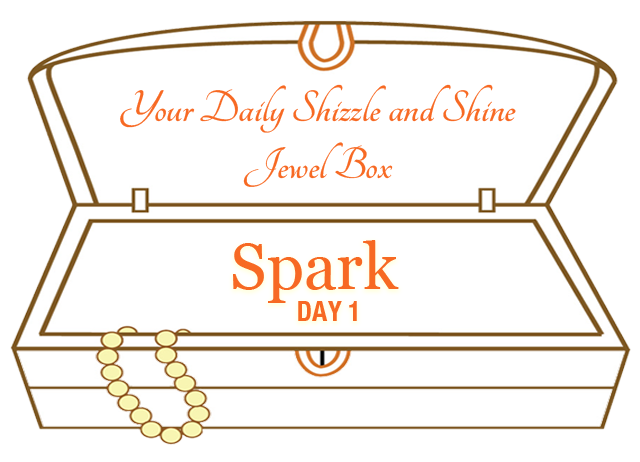 Each day you will receive 3 gems in your jewel box. We are going to start slow and easy and as the days go on, some days will be light and breezy and some days will be intense and soulful. This is the process. Let's roll! 1. Let's start with a dance! Listen and shake it out! Close your eyes and start to move. Have a sense of your body and let your spirit and breath lead you through the movement. Delicious! Share your favorite dance song on the Facebook Group! Let's get a dance playlist together! To learn more about the chakras, here is a resource for you to review. There are other free resources for you to explore at stephanieculen.com. Definitely go there for more! 3. Affirmation for the day: I am amazing. I believe in ME! You are amazing. I believe in YOU! We are amazing. I believe in US! Let's believe in MAGIC! Bonus Visualization: Imagine that all things that you see today has a coating of glitter around it. All things have a sparkly coating of glitter. It is a practice. All things include dishes to laundry to clothes to pets to people to chairs to cars. ALL THINGS! Smile at the sparkle dust and be excited by the shimmer and shine. Bonus Creative Writing Exercise: Using the word SPARKLE, create a poem starting a new word with each letter of the word SPARKLE. Share your ideas on the Facebook Fan Page or in the Shizzle and Shine Neighborhood Secret Group. Remember that the Fan Page is public and everyone can see your postings; the Neighborhood Group is a secret group and only those of us in the Method will see the postings shared. It is up to you where you wish to go. Looking forward to hearing about your journey.